15-Apr-2003 -- My father (Stuart) and myself (Andrew) took a couple of weeks off around Easter to visit the goldfields area of Western Australia. As part of the trip planning I looked for possible confluences. My most optimistic list had nineteen confluences on it! However, we ended up only visiting six. This was the first of those six confluences. We had left Perth on Sunday, 13 April 2003. It took us two days to get to the general area of this confluence. On the way we visited Paynes Find and the nearby gold battery, Fields Find (old gold mine diggings), and Reids Ridge Mine. This last one was interesting as it had only recently been abandoned. Three utes, a big truck and a front end loader were parked nearby. The kitchen still had food in it and dishes on the drying rack! Miners lamps were on charge (by roof mounted solar panels) and working. As far as we could tell nobody had even been here for several weeks, and even then (from their scrawled message) they were just looking. We visited the confluence first thing on the third day of our trip. We'd taken an old station track north from the Warriedar Coppermine Road. Recent rains had made the track muddy in parts with relatively deep ruts. 4WD required. We got to within 550m of the confluence staying on the track. We stopped next to an old cut line, created years ago by surveyors doing seismic surveys. We walked along that until it stopped, with 350m to go. From there we simply took the most direct route through the bush. The ground was hard, flat red sand - easy walking - but with lots of 2-3m high bushes and shrubs to walk around. The confluence itself was just on the north side of one of those shrubs. 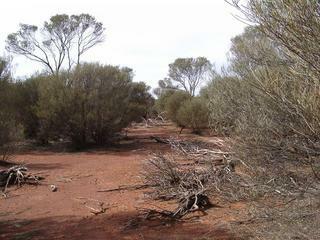 We left the confluence and continued north in the direction of Yalgoo. The story continues at 27°S 118°E.